Suncorp NetSetGO is a fun, safe, social and active program for girls and boys aged 5 to 10. It gives kids of all abilities a positive introduction to netball and teaches them the basic skills of the sport. Suncorp NetSetGO is divided into three tiers; Net, Set and GO, meaning that your child will learn at a pace that’s right for their age and ability. Each week your child will take part in skill based activities, minor games, music, dance and modified matches that will help them develop fundamental movement skills, as well as important social skills like team work. Each session will be lead by an accredited coach, using modified equipment. What tier is right for my child? 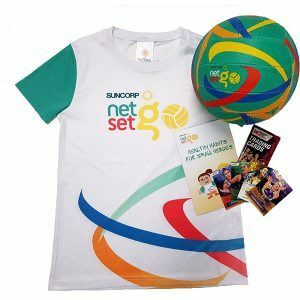 Suncorp NetSetGO is divided into three tiers; Net, Set and GO*. Check out what you get!